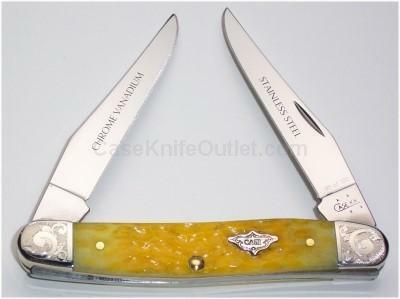 Yellow Jigged Bone, with Case Coat of Arms shield. Dual clip blade material (1) Tru-Sharp® Surgical Steel blade and (1)Chrome Vanadium blade. Production limited to only 100 pieces. Our Own Special Factory Order. Order yours today to ensure you get one. Scrolled Bolsters, Serial numbered. Made in the USA.